The front of the former Espalon restaurant and tavern on Sept.15. 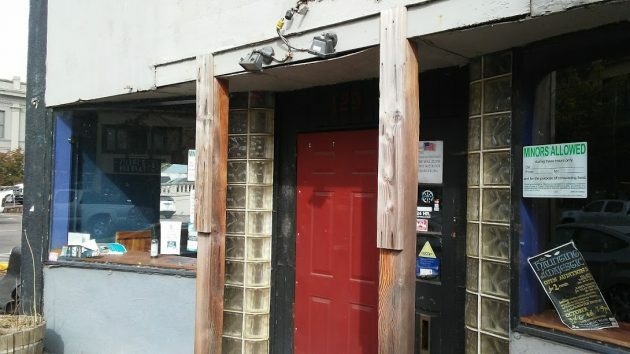 The front of 129 W. First Ave. in downtown Albany looks like the picture of what they mean by “blight.” But maybe not for much longer, as the property known as the Burggraf Building is under contract to a potential buyer. The former “Espalon” restaurant and tavern has been closed for two years. 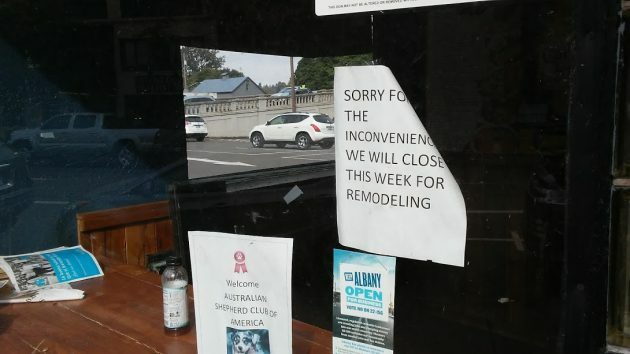 A sign in the window still says it would be closed for a week for remodeling. But when repairs were attempted in September 2016, part of the front wall fell down, and the city issued a stop-work order. The collapsed section was boarded up and the entryway braced, and that’s the way things remain. Gary C. Nieland, who lives in Las Vegas, owns the property, listed on county tax records as having a market value of $256,530. Last November, the owner submitted for city review a plan to renovate the structure. The renovation was designed by Varitone Architecture, and the Landmarks board approved it on Jan. 3, 2018. In March a Salem contractor applied for a building permit, which the Albany Building Division approved but was never picked up. The Albany Civic Theater next door has been interested in the building but is not attempting to buy it now, I learned from Dean Keeling, the theater board’s chairman. Bill MacHugh, an agent with Keller Williams Realty in Albany, had been listing the property for sale. He told me today that it’s “under contract” to be sold. The potential buyer is doing “due diligence,” whatever that means exactly, and if things work out the sale should close in December. That sign in the window, still there last week after two-plus years, proved a bit on the optimistic side. Varitone Achitecture, a downtown Albany firm, designed how the property could be fixed up. IF I OWNED IT I WOULD CHANGE ITS FRONT TO THE WEST, FACING THE PARKING. Seems a shame. Destroy a classic urban Dive to satiate the voracious Downtown Chamber of Correctness. Due diligence means the buyer needs to look into all the aspects of buying the property in other words it’s real estate speak for do your homework. Everything from the permit process to its uses and any issues it might have. If these questions are answered to your satisfaction then you close the transaction. You’ve done your due diligence. The Varitone architectural rendering seems far less interesting than the existing structure. Every town needs a few sketchy saloons. Fix this one just enough to prevent lawsuits and reopen to serve the consumptive needs of Albany’s thirsty hordes. It may look less interesting because the buildings and ground are untextured. They need help from game programmers. That said, I might, sort-of, agree with you.